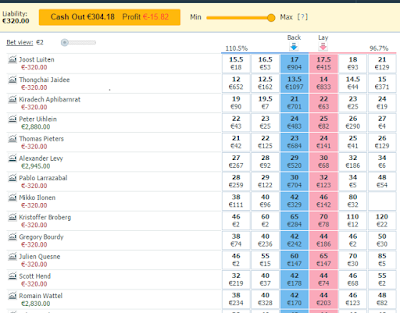 A couple of sidenotes: I did win my local game on return on the last day though which was welcomed! 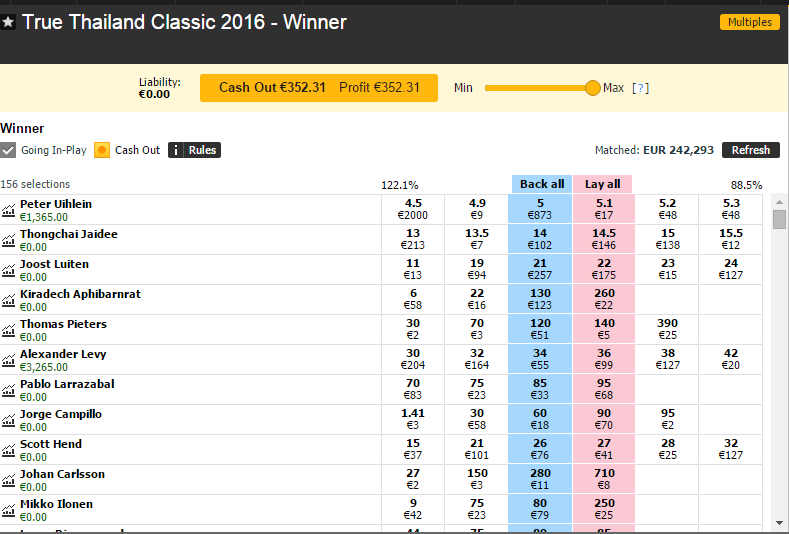 I also got involved in a relatively huge cash game pot allin on flop when I was 52/48% fave - As8s v QhQd on a board 2s4s8c. I had raised pre from MP and opponent flatted. He raised my continuation bet big on flop so I could never just call out of position. I was never folding so jammed hoping I had good fold equity if he had like 99 or TT. He called and we ran it 3 times. He won all 3. Yeah, just my luck. That's 9/1 to happen there. 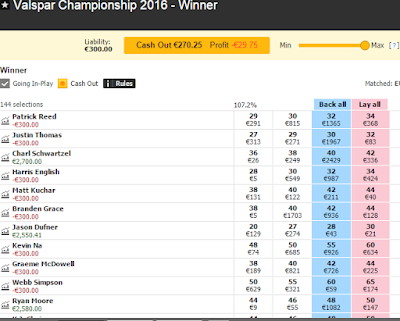 Anyway, back to the golf and the last week before I left was a bit of a crazy one - waking up to find Pelle Edberg - our three fig first round leader EW pick for Thailand - was -9 thru 15 only to drop 2 in his last 3 and finish 1 behind Peter Uihlein, who was also one of our main EW bets. Mixed feelings. Though I suggest if I wasn't sleeping while it was actually happening, I'd have been a lot less happy. Anyway that was a good week despite only having Edberg FRL and top 10 personally but the book looked good with Uihlein and the new early round trading strategy on the shorter priced picks has been working well in general. 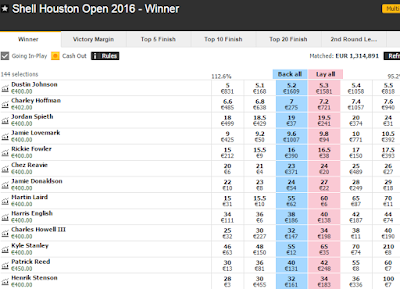 It's gone well again in Houston too where I've just exited for about 150% profit. As you know if you've been reading it's now all about lessening the variance for me so there won't be too many big winning weeks but we can and have been limiting the damage to sweet F.A in the bad tourneys. If things keep going well then I can look at raising the stakes. 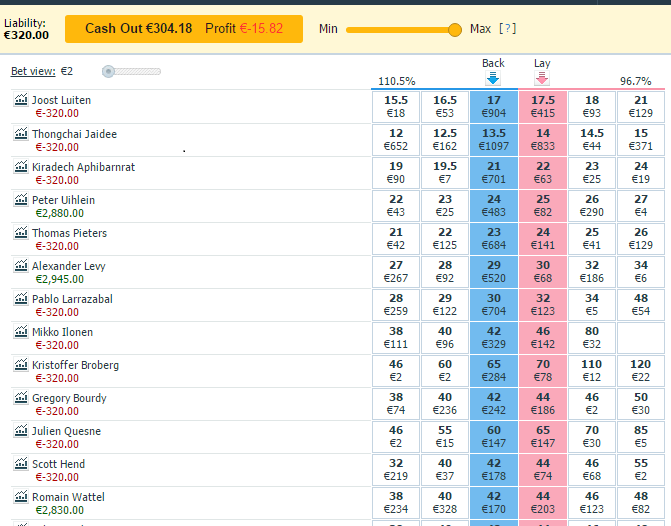 The first week of playing poker we had an unexpected winner at Valspar which I think was the same week as Thailand actually and it put us into profit for this season at about 23% ROI. 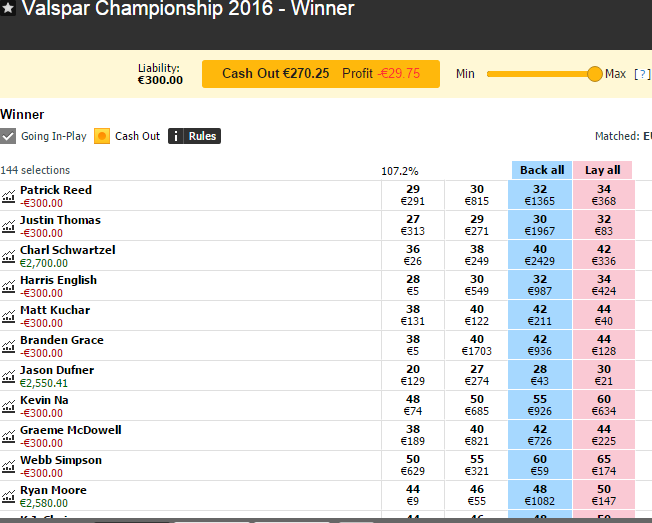 The book below is an interesting one as I got out after the 2 rounds before heading to the hotel for a small profit and Schwartzel then went on to blitz the weekend. Oh Well. Many blog readers got the big payout and I'm happy with that. It's something I'll have to live with a lot when trading early but I'm happy to keep the graph more steady. 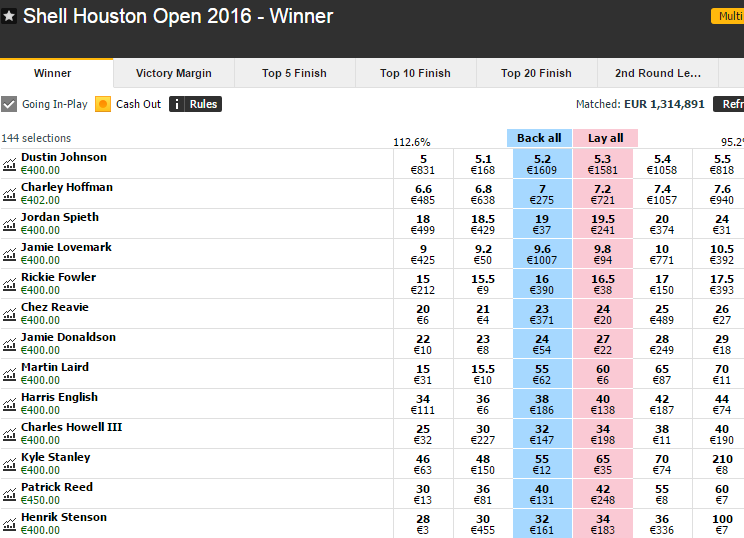 The last weekend of the poker the EW plays were also in a great position at Puerto Rico. I didn't get involved in the matchplay. 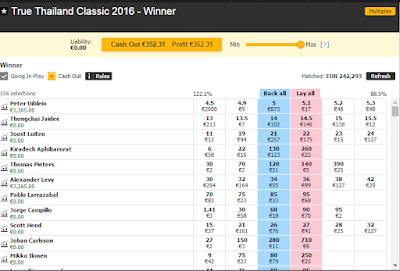 I was already out for around 100% profit on outlay but unfortunately Sunday was one of those backwards days and I'd have won more if Byrd did the business. I also had 1 solitary team in the $100 DFS which could have finished very high if Brown and Byrd (and Fathauer) went the other way. Langley and Kelly had posted good final rounds. 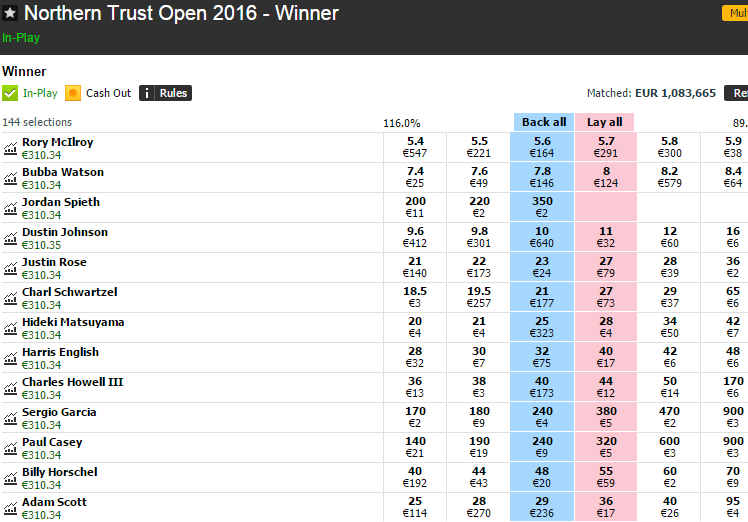 The Northern Trust and Honda Classic were interesting and you'll see below a 1,2,3 step by step process in trading the Honda. 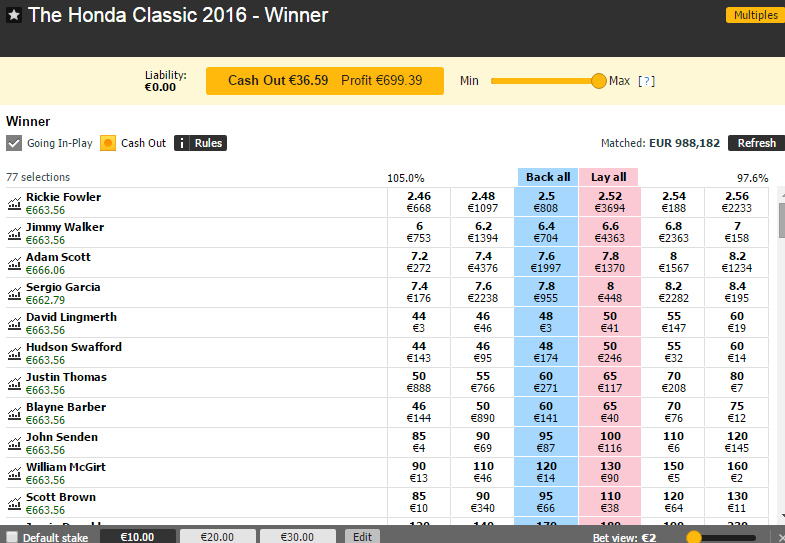 The below Honda Classic screenshots give a guide to the trading book antepost, and then after 36 holes when I've equalised. Walker did the business and despite Lowry trading in single digits, I didn't even manage to take anything back on him. I can't even really remember what happened at Northern Trust at Riviera as I'm a bit discombobulated still, and lazy, but seems it was a no stress event too. 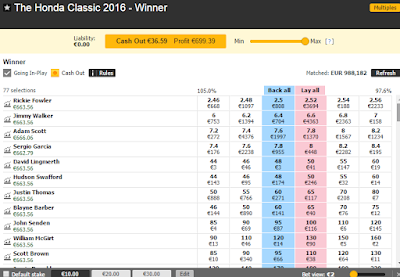 I think it was Bubba who brought in the profits and a win for the blog EW punters. Daily Fantasy sports I've found a little tougher than I thought to begin with. I have some partners on board putting in teams for me as I can't register an account in Ireland yet and it's tough to learn when I can't see exactly what's going on. Didn't do much personally during the last 3 weeks but I've drafted 19 teams in total for the Masters Millionaire maker and hopefully variance will fall in our favour there. I think we've still got a few teams in the payout zone at Shell. The cut is a big thing and so far too many are missing it by a shot ot 2 so maybe that's something I need to look at. I'm getting more of a feel for ownership %s. I think my main strategy as a core is more than solid but we shall see.